This is it! 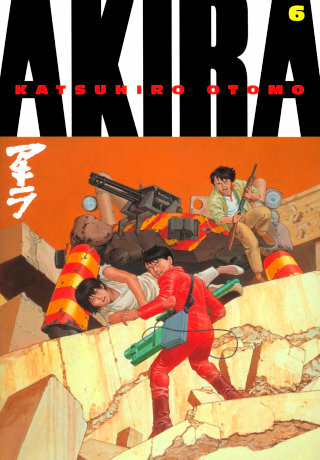 The final chapter of the epic manga series by one of Japan best comic creators, Katsuhiro Otomo: AKIRA. Akira Volume 6, subtitled “Kaneda” is the 6th and last collected graphic novel edition of the series. The original Japanese version was first published in 1993, while the English version was first released in 2002 by Dark Horse Comics. Otomo’s AKIRA manga series has captured and mesmerized readers across the globe, especially since the release of the animated film adaptation. Akira Volume 6: Kaneda brings a stellar conclusion to the gripping and suspenseful story of series. Picking up what was left by the previous book, Tetsuo’s power grew even stronger and out of his own control as he morphed into a monstrous form. Used as a medium for the combined power of Lady Miyako and the other Espers, Kei became the only hope to fight against Tetsuo’s raging power. Kaneda and his motorcycle gang raced to the stadium to launch their own attack toward Tetsuo. The Colonel made an attempt to guide SOL satellite laser destroyer toward Tetsuo. Meanwhile, George Yamada and the American force planned to kill Tetsuo with biological weapon. However, Tetsuo eluded all those attacks and even absorbed more power. He then grew into a monstrous, gigantic, amoeba-like mass that swallowed everything. Kaneda was also absorbed into the mass. Akira was trying to control Tetsuo with his own power but he got shot. With the presence of Akira’s power gone, Tetsuo was able to locate the power of Lady Miyako and the other Espers. So he launched an attack at Lady Miyako’s temple. She was already set to sacrifice her life to hold off Tetsuo while the other Espers made an attempt to rescue Akira and Kei directed the SOL satellite destroyer toward to shoot Tetsuo with the gigantic laser. If all of those attempts failed, Tetsuo power might grow and destroy the Earth. The explosive finale to one of graphic fiction’s greatest achievements is here! The mad psychic colossus Tetsuo, the world’s military, and the remaining psychics of The Project face off — with the child psychic god, Akira, the wild card — in what may not only decide the fate of mankind, but may determine the next step in human evolution! This long-awaited volume — a staggering 440 pages — features the impossible-to-find final chapters of Akira, never before collected in the U.S., presented as they were intended to be seen in their original, stunning black and white! Featuring a revised translation and top-quality art reproduction, this is the final edition of one of comics’ definitive works, a six-volume epic of over two thousand pages. Katsuhiro Otomo’s entire masterpiece is finally available — only from Dark Horse!